EDINBURG — After a five-year run that established him as the winningest head coach in UTRGV women’s basketball program history, Larry Tidwell is resigning to become the Chief of Staff for Texas Tech women’s basketball. Tidwell said his agreement with Tech was finalized late Friday night. He met with his UTRGV players on Saturday morning, and the university announced the move a few minutes later. In five seasons at UTPA and UTRGV, Tidwell set the program’s all-time record for wins (85) and winning percentage (.531). His bio on the UTRGV athletics website says his teams have broken 117 program records and tied 83 others. 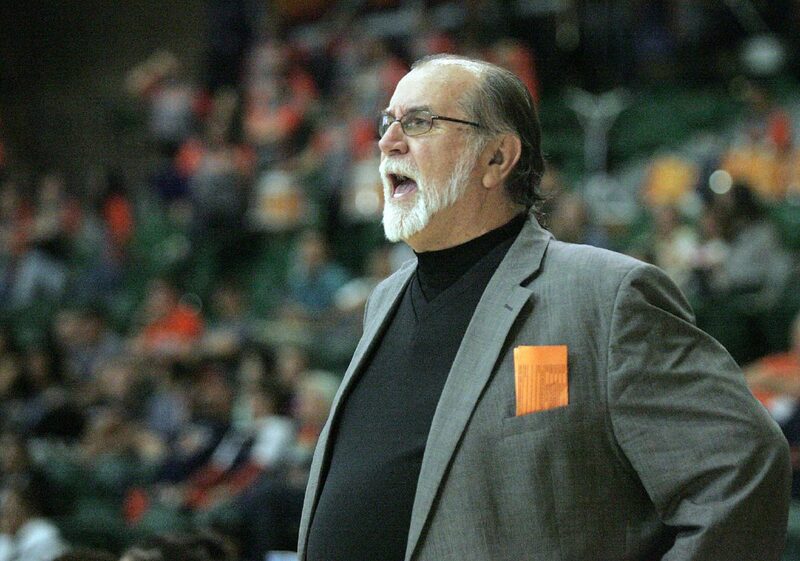 Before his arrival, UTRGV had gone 30 years without a winning season. Tidwell said Texas Tech reached out to him about the opening on April 10, and he initially declined to entertain the possibility, instead focusing on national signing day April 11. Marlene Stollings was announced as the new head coach at Texas Tech on April 9, and Tidwell said he and Stollings share the same agent. The opening at Texas Tech gives Tidwell the opportunity to be closer to his mother and the rest of his family, who are based in Fort Worth. Set to turn 65 next month, Tidwell said the position with the Lady Raiders will likely be his last stop before retirement. He was an assistant at Baylor when the Big 12 began competition in 1996, and he liked the idea of closing out his career in the same conference. Tidwell said he leaves the Valley on Monday and begins work in his new position Wednesday. Texas Tech has not posted a winning season since 2012-13. The Lady Raiders went 7-23 during the 2017-18 campaign, including an 80-64 win at home against UTRGV on Dec. 17. Texas Tech has reached the NCAA Tournament 20 times in the program’s history, winning a national title in 1993. Though not the Lady Raiders recruiting coordinator — that title belongs to Erin Grant, a former Texas Tech player who Tidwell tried to sign in 2002 during his tenure as the recruiting coordinator at TCU — Tidwell said recruiting will be his primary focus. He plans to use his 40-plus years of coaching at the high school and college level in Texas to secure some of the state’s top talent while tapping into the connections he’s built recruiting players from at least 25 different countries. He brought in two recruiting classes that ranked in the top 10 nationally during his tenure at TCU, and he has signed 40 student-athletes who went on to play professionally, including five WNBA players. “I just wanted to challenge myself to see if I can help Texas Tech do that,” Tidwell said. The UTRGV program had never posted a winning record in a season at the Division I level before Tidwell notched three consecutive winning campaigns from 2014-17. The program advanced to the postseason for the first three times in its history, reaching the WBI twice and the WNIT once, and won the first postseason game in program history, knocking off Stephen F. Austin at home in the 2017 WBI. The Vaqueros went 14-16 in 2017-18, and Tidwell said he is disappointed to leave after a down season that was marred by injuries. Perhaps the only goal left unreached during his tenure was winning a WAC championship to advance to the NCAA Tournament, as UTRGV came up one game short with losses in the conference tournament title games in 2015 and 2016. In April 2016, Tidwell signed a contract extension set to pay him a base salary of $175,000 annually through the 2019-20 season. Tidwell said he took great pride in his involvement in the Valley community, attending more than 200 high school games, hosting three camps and a coaching clinic each year, and serving on the Rio Grande Valley Sports Hall of Fame’s board of directors. He said his teams averaged more than 1,000 hours per year of community service and public relations. He signed three players from the Valley and had many more join the team as walk-ons or student assistants. Looking back at his tenure, Tidwell was adamant about thanking everyone who played a role in the program’s success: his players and assistant coaches, the coaches of UTRGV’s other athletics teams, the surrounding support staff and the administration, all the way down to the pep band, cheerleaders, dance team and super fans like Ted and Catharyn Von Ende. “You’re trying to help grow the game in the Valley. That’s what we did,” Tidwell said. “It’s been a great journey. Been five very, very strong years. In that time, became the winningest coach in the history of the program. That’s pretty cool. Prior to starting at UTRGV, Tidwell was the head women’s basketball coach at Lamar for six seasons. He previously spent eight seasons as the associate head coach and recruiting coordinator at TCU from 1999-2007 and six years as an assistant coach at Baylor from 1992-98. He’s also coached at Frisco High School, Schulenburg High School and Mexia High School.